When I started seminary in 1990, I wrote all of my papers on a typewriter. Personal computers were available at that time, but they were expensive and out of my price range. In fact, I didn’t own a personal computer until 1996. Like everyone else at that time, I did Bible studies the old fashioned way, with a stack of books piled high on the desk, the floor, my lap, and wherever else I could find some room. It was not that long ago that some of the most helpful time saving tools for Greek and Hebrew study were publications such as the huge four-volume Analytical Key to the Old Testament by John Joseph Owens and the various analytical lexicons. Today, tasks that would have taken several hours back then can be completed in minutes or seconds with the use of various Bible Study software tools. One such software program is Accordance, produced by Oak Tree Software, Inc. First released in 1994, Accordance is the only full-featured Bible study program designed specifically for Mac users. Until very recently, I was a PC user, so when I switched to Mac, I was interested in what Accordance could do. In the interest of full disclosure, the copy of Accordance I am reviewing is a review copy of Accordance 8 sent to me gratis by Oak Tree. Accordance does not provide a “one size fits all” package. The way they offer their tools may best be described as a “buffet.” For those who are unfamiliar with Accordance, it may take some time perusing their website or speaking with a sales consultant to figure out what package is right for you. The basic Accordance Primary 8 DVD includes over 400 texts and tools organized into different packages. You only pay for those you need. You purchase unlock codes that allow you to install the texts and tools you choose. You can also purchase certain collections of tools at different levels. There is an English Studies track (the Library 8 collection) that is offered at four levels: Entry, Introductory, Standard, and Premier. The higher the level you choose, the more tools you are able to unlock. The English Studies track includes English Bibles, commentaries, dictionaries, and other such tools. The Original Language track (Scholar’s 8 collection) is offered at three levels: Introductory, Standard, and Premier. It offers a number of Greek and Hebrew tools. There are also numerous additional modules that can be purchased separately, such as advanced reference works, graphic resources (atlases and photo guides, for example), and original language tools. The package I am reviewing is Accordance 8 with the Standard Level Library 8 package, the Standard Level Scholar’s 8, and the Graphics DVD bundle. The installation process is relatively straightforward and simple. It is imperative that you have your product unlock codes before beginning the installation because you are prompted to enter them during the process itself. Although relatively simple to do, the installation itself is somewhat slow and there were a few times that it seemed as if the installation had frozen. I left things alone, however, and eventually it progressed and completed. Accordance 8 provides users with fast and easy search tools, statistical analysis, instant parsing, and more. 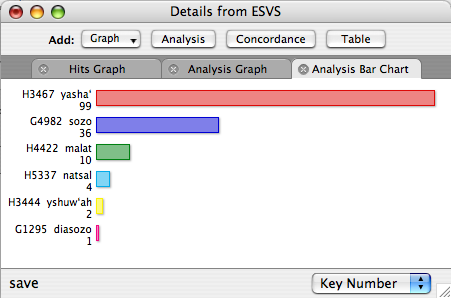 The main interface is the Workspace Window that allows the user to view all open Bibles, dictionaries, commentaries, etc. in a single window in parallel panes. The Workspace Window contains a search section, a search results section, and a navigation bar that enables the user to scroll up or down verse by verse, chapter by chapter, or book by book. To the left of the Workspace Window is the Library Window. Every Accordance resource you purchase or unlock is listed in the Library Window for easy access. Below the Workspace Window is the Instant Details box. The information that appears here varies, depending on the specific resource the user is consulting. If, for example, you are consulting a Hebrew or Greek text, the Instant Details box shows all of the parsing information for any word that the user puts the cursor over. If the user is consulting a map and places the cursor over a point on the map, the Instant Details box will show the longitude, latitude, and elevation of that point. To the right of the Workspace Window is the Resource Palette. The resource palette allows for amplification of any search. If the user highlights a particular word, for example, further information about that word can be found in various dictionaries and lexicons, using the Resource palette. There are also a variety of language resources here. If the user highlights a Greek or Hebrew sentence or phrase, he or she can quickly obtain syntactical analysis, diagramming tools, and other information. There is also a button that provides spoken pronunciation of the selected Greek or Hebrew text. This particular tool needs work since it sounds like one of those automated recordings that pronounces words in a machine like way. 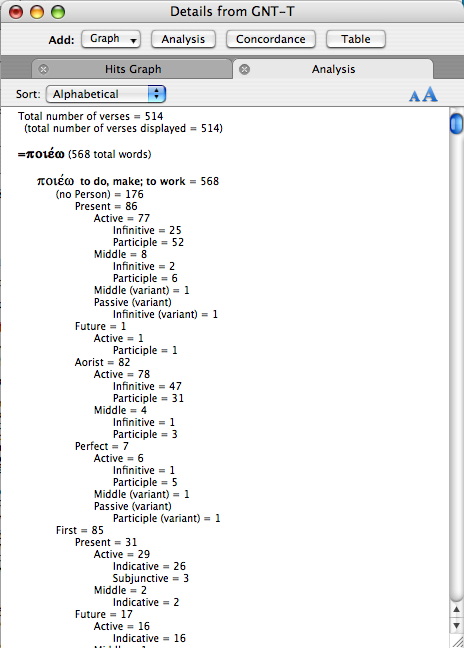 Accordance allows the user to search texts by word or by verse. Different translations can be easily compared by adding a parallel pane with a new translation. The range of searches is simple to adjust. A particularly helpful search feature is the “Details” button. After any search, the Details feature will allow an impressive range of analysis choices (I’ve included screen shots of just a couple of the many ways you can arrange the information in an analysis). Even more complicated searches can be performed by clicking on “Search” in the top menu bar. Any window in Accordance can be copied and pasted into other programs such as Word or Power Point. If you drag your cursor over any word in an opened Greek or Hebrew text, you will see parsing information in the Instant Details box. If you triple click on the word, its lexical entry will appear. Accordance allows searches of any kind and complexity imaginable. Information on how to perform the various kinds of possible searches may be found by clicking the Help button and opening the electronic manual. The graphics package I was sent includes an atlas and a timeline that enable the user to do all kinds of helpful tasks. The Bible Atlas includes an impressive array of features. Various overlays are available. The user can, for example, overlay the basic map with important cities, roads, and regions from various periods in biblical history. 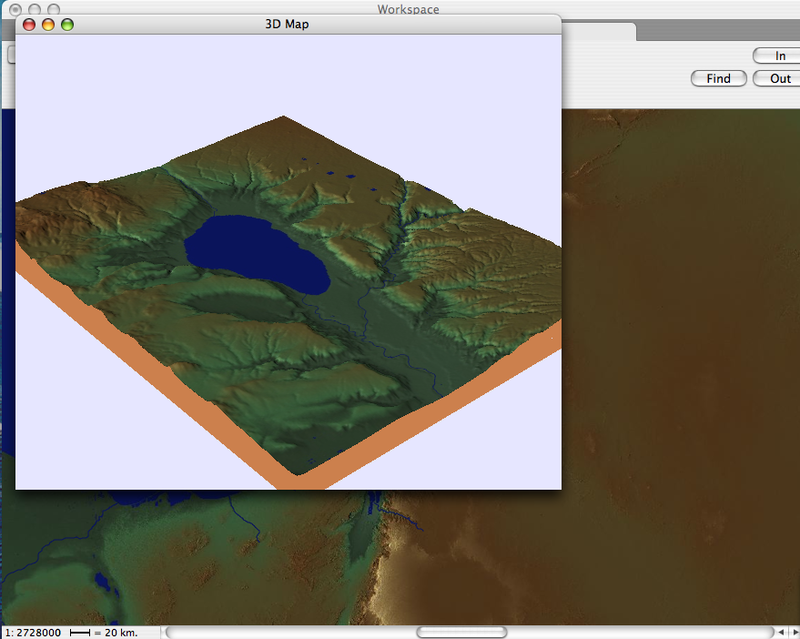 A 3-D function allows the user to select a portion of the map and view the features of the terrain in three dimensions. 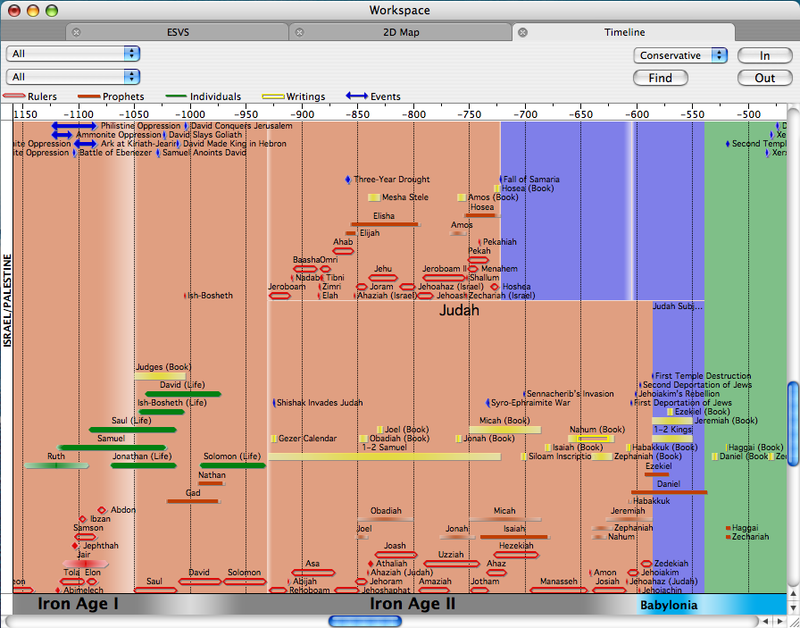 The Timeline allows the user to see when biblical events occurred in relation to other events around the world. With the Photo Guide, the user can click on any city, river, or region and immediately pull up full-color pictures of that location. There are many more features in the Accordance software, some of which I probably haven’t even found yet. Many other resources are available, but at an additional cost. The Interface and Search capabilities of Accordance are outstanding. The speed, flexibility, and power are more than adequate. There is a learning curve, but if you take the time to read the electronic instruction manual and watch the online demos, you will be able to accomplish most of the basic functions available. The more advanced search functions will take a little more time to master. For the needs of most pastors, the Standard level package should be more than sufficient. There is also a Super Bundle, which includes the Premier Library, Premier Scholars, and the Graphics Bundle for $639. This is about $200 less than the cost of purchasing each of these three packages separately. Furthermore, Accordance has a 10% discount for pastors, full-time students, and missionaries serving abroad. Many additional modules can be added for a price. The Accordance brochure indicates that you can unlock all of the Scholar’s Collection modules for $3,000. As far as I can tell from perusing the list of modules in the Scholar’s Collection, this does not include the standard Greek (BDAG) and Hebrew (HALOT) lexicons, which are available as separate modules for $150 and $159 respectively. In short, if you want to take full advantage of all the language resources available from Accordance, it is going to be costly. If you can afford the modules you need, however, Accordance is a fun and fast Bible study software program that will save you a lot of time. For more information, visit the Accordance website.